This practical dress uses fabric economically, yet still looks chic and trendy. View A features round neck with collar points and peplum cleverly cut on the straight grain but with the slimming look of a bias cut. View B is more casual, with buttoned front, flounce collar and sleeves, and eyelash pockets. 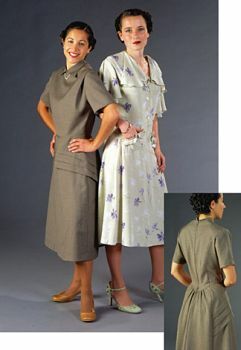 Both dresses have a flattering dropped waistline in back, slightly flared skirt, back zipper, and unpressed tucks in front that eliminate the need for bust darts and create the fashionable broad-shouldered look of the late-1930s period. Suggested fabrics: Rayon, medium-weight silk, microfiber, or other fabrics with drape. View B is particularly attractive in small-print fabrics with sheer flounces.